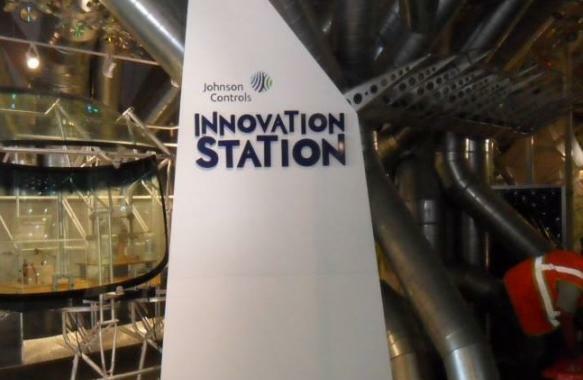 Johnson Controls, Inc. sponsors three new exhibits at Discovery World Museum that showcase the highly innovative work the company has done throughout its history. There are 3 phases to the expansion: Innovation Station, Innovation Gallery and Innovation Planet. The in-house staff at Discovery World developed all of the creative design and we are extremely pleased they chose to partner with us again on their custom exhibit signs. In the past, we’ve worked with them on corporate exhibits like BIG (Caterpillar) and Milwaukee Muscle (Briggs & Stratton). The third and final phase is a hanging channel letter sign for the “Innovation Planet”. Each letter is about 41” tall; all of the letters are custom depth and have 2” aluminum square tube joining them together. Discovery World is providing the programmable RGB LED internal illumination. The sign will be suspended over a one story spiral staircase on a track to enable access for maintenance and service. The power supply will be internal. All the LED’s are mounted on a baffle inside the letter.